This review first appeared in the October 10, 1984 issue of The Daily Aztec. When a musician leaves an established, successful band to go solo, it's usually to try something new. 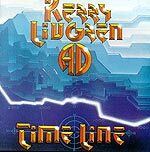 However, that doesn't seem to be the case with former Kansas guitarist and songwriter Kerry Livgren. Livgren's new band, AD, sounds like a clone of Kansas (and even includes fellow Kansas veteran Dave Hope on bass). But where Kansas had a unique sound to separate it from other prog-rock bands, AD never establishes an identity. Its new album, "Time Line," is boring, predictable and void of good material. The first side opens with the title track, an uninspired and plodding self-parody. Likewise, the next three songs are also derivative of the Kansas style without adding anything new. The second side opens a bit stronger with "New Age Blues," a catchy, upbeat rocker. Livgren plays a nice intro on guitar, and Warren Ham performs an enthusiastic harmonica solo. "Life Undercover" is the most original cut on the album. Ham intersplices strong lead vocals with creative saxophone solos. Michael Gleason harmonizes well on piano, and the overall effect sounds like nothing else on the album. While Livgren attempts to and often does capture the Kansas sound (much of which he helped create in the first place), the result is nowhere near as creative. Livgren would be better off returning to Kansas if that is the sound he truly wants to explore.